Being a high school teacher myself and also a person who, as a kid, was bullied pretty mercilessly before my growth spurt, the next film I chose holds a special place in my heart. Based on the brilliant novel from Stephen King, Brian De Palma’s 1976 classic Carrie is still incredibly relevant, especially in the age of the cyber bully and the serious onset of depression and suicide in kids aged 11 – 18. This movie is an important socially as it is horror-wise, and it is also another great edition to this year’s classic/remake list. 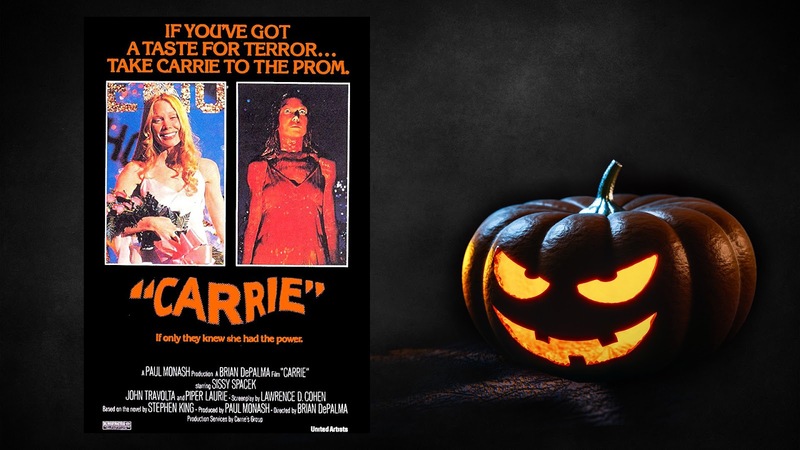 Carrie follows 16-year-old high school student Carrie White as she battles through a hellish life. She is incessantly bullied by the popular girls in school and when she gets home, she is set upon by her religious zealot of a mother who has perverted Christianity into a series of whippings and punishments because human beings are unclean sinners. When Carrie gets her first period while showering after gym class, the student body tortures her by lobbing tampons at her while screaming “plug it up.” Not understanding what is happening to her body (because her mother never explained the female body to her), thinks that she is dying which only leads to more ridicule from her peers and even more chastisement from her mother, who now blames Carrie’s unclean thoughts on her menstruation. A kind and well-meaning teacher takes to punishing the girls who bullied Carrie but it only incites the rage of one well-to-do, entitled girl named Chris who blames Carrie for all of her punishment, and sets out to get revenge on her. Another of the more popular girls, Sue, tries to make it up to Carrie by having her boyfriend, the kind and funny Tommy, ask her to the prom. After numerous attempts, Carrie finally agrees and starts to enjoy herself. She is elected Queen with Tommy as her King, but just as she begins o feel accepted, Chris and her boyfriend, Billy, execute their plan, dousing Carrie in pigs blood and seriously injuring (killing?) Tommy. 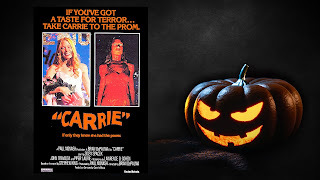 After these events, Carrie reveals that she has developed telekinesis and begins to systematically kill every single person in the dance, including both students and staff of the school. The ending is violent but even more so sad because of the life Carrie has been forced to live. This movie is amazing. There….I said it. It is shot well, acted well, the music works, the directing works. Everything about this movie is done damn near perfectly, which begs the question as to why it would need remade (but we will tackle that in a few weeks). Brian De Palma has directed so many classic films (Scarface, The Untouchables, Mission: Impossible) but Carrie has always been my favorite of his works. Sissy Spacek soars as the meek but eventually psychotic Carrie White. Her unconventional look and her terrifyingly emotive eyes contribute more to the movie than anything else. She can play the sad and depressed teen but has no issue transforming into the murderer and then again into the grieving daughter. Her range is one of the major contributing factors in this movie’s success. Most of the other performances are good but forgotten in the wake of Spacek’s brilliance. The only other major standout is Piper Laurie who portrays Carrie White’s psychotic and abusive mother with such gusto that she feels like she got lost coming home from a meeting of the Westboro Baptist Church. She is the scariest part of the entire film. William Katt and Amy Irving are convincing as Tommy and Sue and Nancy Allen is a downright monster as Chris. Showing up in a small role is a very young pre-Grease and pre-Saturday Night Fever John Travolta who is convincing as the high school jock and bully, Billy. If you have ever been bullied or have ever just wanted to see the rich, entitled kids get their comeuppance, this movie is meant for you. It speaks to the high school experience in a way that few other films can.